Barron Lighting Exitronix® LL50H Series High-capacity emergency light unit comes with two 12-Watt MR16 halogen lamps. It features white thermoplastic housing for longer endurance and rugged usage. It has voltage rating of 6-Volt DC and 120/277-Volt AC. Emergency light unit features sealed lead acid battery that offers 90 mins of run time and lasts up to 5 years. It measures 5-7/8-Inch x 5-1/2-Inch x 12-1/8-Inch. 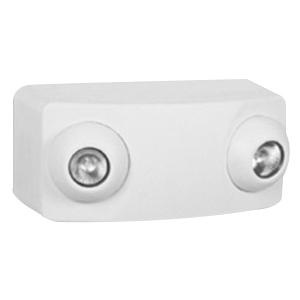 Wall mountable light unit is ideal for industrial and commercial applications. Low-voltage disconnect eliminates deep discharge. It features AC lockout for ease of installation and installer protection. Light unit has power rating of 50-Watts. It offers brownout, short-circuit and voltage surge protection. It withstands temperature rating of 59 to 104 deg F. Emergency light unit is UL listed and meets NEC/NFPA standards.